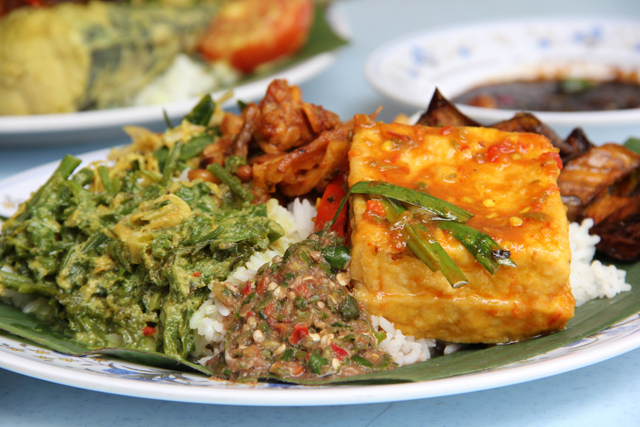 “Eating (and loving) Malaysian food should be a prerequisite for anyone proclaiming to be a gastronome. The holy amalgamations of Malaysian flavors are strengthened, not only by fierce spices, but by a group of people that are intensely passionate about their cuisine. We Malaysians are a lucky lot. Here in our multiracial community, we have exposure to all sorts of cuisine. Chinese, Indian, Malay.. you name it, we have it. 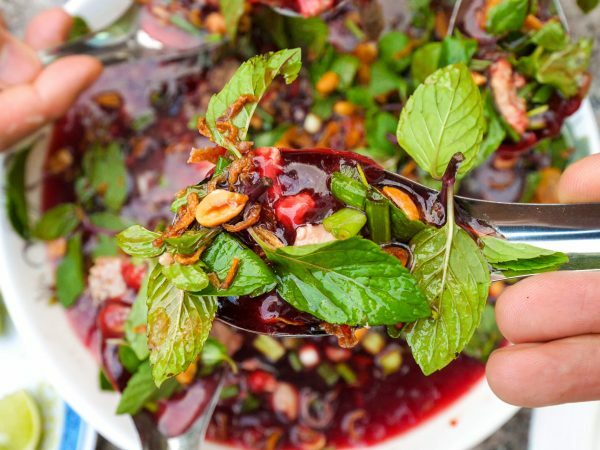 Some of these ethnic cooking styles might be more bland or less spicy than others, but I have to say that all are equally interesting in their own way. Here are 10 of my own personal favourites, but if I had my way it, would be 20 ! One of the great south Indian cuisines we have the privilege of eating on a daily basis should we chose is, of course, Chettinad cuisine. Chettinad cuisine is the cuisine of the Chettinad region of Tamil Nadu state in South India. If you love rice, you will definitely love the Banana Leaf Rice. In banana leaf rice, white rice is served on a banana leaf with an assortment of vegetables, curried meat or fish, pickles, and the super addictive papadum ( look like giant, round, flat crisps). Most of the time, however, only the gravy of the curry will be served and no meat is served as it is meant to be a traditional Indian vegetarian dish but since I am no vegetarian, I love mine with mutton redang and dry chicken curry! This meal can get really sloppy since it is traditionally eaten with the hand, but most of us have this down to a fine art! No Malaysian food lunch spread is complete without the Nasi Dagang. It is a well-known breakfast food in the states on the East Coast of Peninsular Malaysia, such as Terengganu and Kelantan. 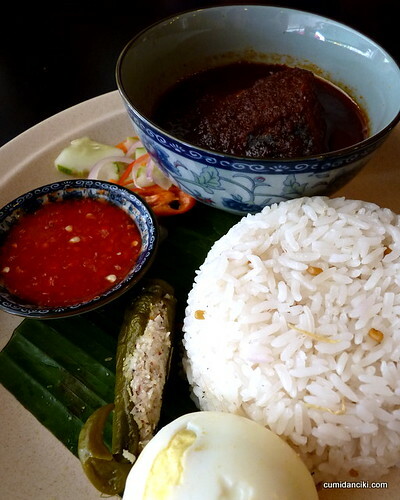 The most famous Nasi dagang of Terengganu comes from a place called Kampung Ladang, an area within the Kuala Terengganu district. I have not tried the one from Kampung Ladang but my colleague who covers the East Coast says it’s truly the best. The name literally translates as “meat bone tea”, and, at its simplest, consists of fatty pork ribs simmered in a broth of herbs and spices (including star anise, cinnamon, cloves, dong guai, fennel seeds and garlic) for as long as possible , i.e. days if possible. However, additional ingredients may include offal, varieties of mushroom, choy sum (vegetables), and pieces tofu puffs. We personally have the highest regard for BKT at ‘Restaurant Yik See Ho’. 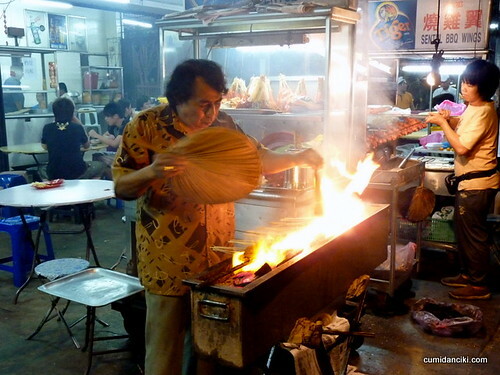 This place is situated in the vicinity of the Pudu Wet Market and is a hot favourite amongst KL-lites. Some may beg to differ or have their own favourites but for now, we bring all our friends here. Where else can you see the butchers hacking away at the pig carcass (corner alleyway), in preparation for tomorrows rations, from where you sit and eat along the 5 foot way. Grim? Gross? Well, this is BKT, Pudu style! 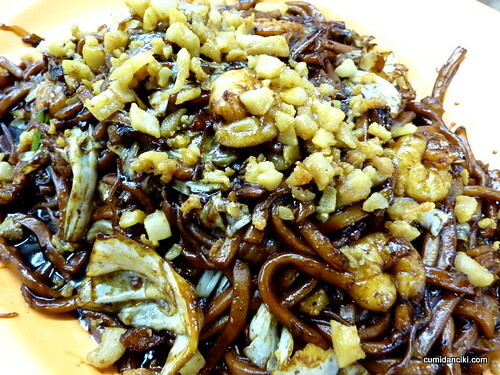 Fried Hokkien mee (Chinese style- fried yellow noodles) has a cult following in Kuala Lumpur. It is a dish of thick yellow noodles braised in thick dark soy sauce with pork, squid, fish-cake and cabbage as the main ingredients and cubes of crispy fried pork lard as garnishing (that would be the square cubes that you see on top of the noodle). Some might say that the pork lard is the main ingredient. This dish is eaten before a huge night out, after a huge night out, for dinner, for supper .. heck , at all hours of the day really. If you have not eaten Hokkien Mee, you have not visited Malaysia, proper! Next up is the Sang Har Kwey Teow (flat noodles). This is fresh river prawns cooked Cantonese style in a thick eggy broth and finished off with either flat or egg noodles. The orange roe in the head of the prawn just seeps and infuses into the eggy liquid sauce of the noodles and makes the taste phenomenal. The amazing way that the tautness of the prawn flesh blends into the springiness of the flat noodles is like these two components were just made for each other. After the Sang Har Mee, we will definitely drag you to eat, the Sentul Satay. Close analogues would be the Yakitori from Japan, the Shish Kebab from Turkey, the Sosatie from South Africa.. oh, and my most recent discovery was the Chuan from China! 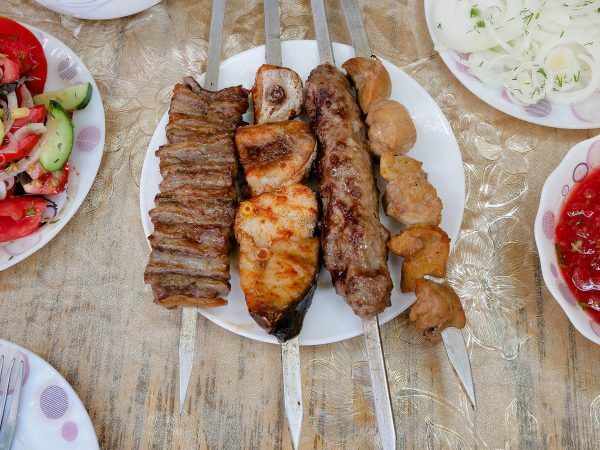 Meats on sticks over a BBQ – basic yet effective. Tapping into that childhood ‘fun’ way of eating your food. For satay, the “must have” ingredient which gives the dish its characteristic yellow colour derived from tumeric. Serve it up with a spicy peanut sauce dip, or peanut gravy, slivers of onions and cucumbers, and ketupat (rice cakes).. and you have a balanced meal of carbo, protein, fats, and vegetables but tastes delightfully sinful.. not unlike junk food! If you are a rice lover, this is another amazing local dish that you cannot miss. Nasi Kandar is a popular northern Malaysian food, which originates from Penang. It is a meal of steamed rice which can be plain or mildly flavored, and served with a variety of curries and side dishes.The rice is accompanied by side dishes such as fried chicken, gizzards, curried mutton, cubed beef, fish roe, fried prawns or fried squid. The vegetable dish would usually be brinjal (aubergine), okra/bendi (lady fingers) or bitter gourd. A mixture of curry sauces is poured on the rice. Always ask for the sauces to be mixed , i.e. fish + chicken + dhal .. let it soak through your rice and just die from the awesome aroma and taste. This is called nasi ‘banjir’ (flooded rice) and imparts a multifaceted taste to the rice. Many eat the sauced soaked rice with their bare fingers and the aroma actually stays with you long after you have washed your hands. This is part of the appeal of eating Nasi Kandar! Charsiew (BBQ Pork) is another great dish.. Charsiew literally means ‘burn with a fork‘ where long gorgeous fatty strips of seasoned boneless pork are skewered with long forks and placed in a covered oven or over a fire. The meat, typically a shoulder cut is seasoned with a mixture of honey, five-spice powder, fermented tofu , dark soy sauce and possibly hoisin sauce. The melting sugar plus the seasoning will turn the exterior layer of the meat dark red, not dissimilar to American barbecues. A sugar coat is sometimes used in the place of honey to give char siu its characteristic shiny glaze. Here in KL, you can get amazing charsiew with a texture so soft and succulent in the centre, sweet and caramalized on the outside, it would make a grown man weep! 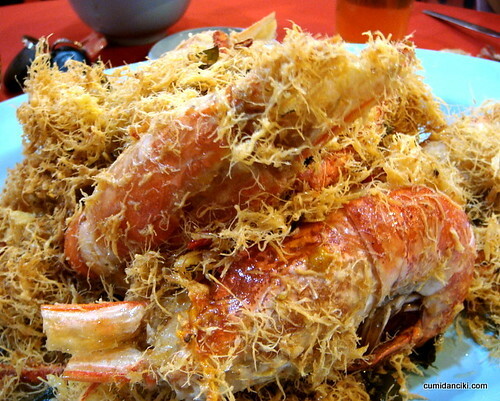 Lung Seng Tanjung Tualang, Perak (North Malaysia) – everybody needs to make this ‘holy’ pilgrimage to the mecca of Fresh River Prawns and all things crustacean at least once in their life-time. As a matter of fact, KL city folk don’t mind the 2 hour drive to Tanjung Tualang in Perak just to satisfy their yearning for delicious freshwater prawns. They don’t come fresher than this (swimming outside in tanks) and the cooks actually drop them into ice water for five minutes to stun them before they prepare them for cooking. This retains the springy texture and flavour in the meat. Butter River Prawns.. Mouth-watering! Nasi Lemak is a must! The name itself ” rice in cream” is derived from the cooking process where regular white rice is literally soaked in coconut cream and then steamed to give a gorgeous, aroma of coconut-perfumed white rice that is then wrapped in banana leaf or served on a plate and eaten with the other side dishes mentioned above. Sometimes a knotted pandan leaf, or ginger or a stalk of lemongrass is thrown it to make the rice all the more fragrant. 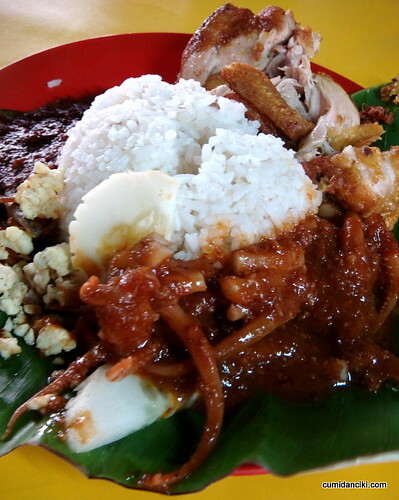 The Malaysian nasi lemak consists of a hot spicy sauce (sambal), hard boiled egg, cucumber slices, small dried anchovies (ikan bilis) and roasted peanuts at its core and to this you may add sambal cuttlefish, fried chicken, cockle, stir fried water convolvulus (kangkong), pickled vegetables (achar) or beef rendang (beef stewed in coconut milk and spices). Sinful and bad for the heart but incredibly delicious.. If you eat this once in a while, it’s not so bad! 69 comments. I'd love to hear from you! Hi I’m about to visit Malaysia in April with my mother. I’m quite adventurous when it comes to food but my mother is really bad with spicy food, even mild spice! She doesn’t mind herb and flavourful foods, what dishes can anybody recommend? Cheers. Great review ! we will be visiting Malaysia on end March 2017. Your article just wanting us to prepone our family trip. You should come down (Klang, Malaysia) to try our famous Bak Kut Teh. It’s more mouth watering and It’s different than the KL’s BKT version! You will love the dry Bak Kut Teh without the soup! You should visit sarawak! their river prawn, and fish..to die for! Hi Nicole, thank you very much, I really hope to visit in the future! Hey Razly, thank you for sharing, glad you can now get great nasi kandar in KL too! My daughter and I will visit Malaysia on May 25 to May 26, 2014. Your blog will be a big help to us. We love to explore and try the authentic foods of the place we visit. Thanks! Great to hear that May, hope you and your daughter have a wonderful trip. Hi! I was in Malaysia just a couple of weeks ago and the food was amazing. Love this post! Keep on rocking! Personally I found it insulting that you compared muslims holy pilgrimage to Mecca with your personal travel experience getting the best prawn in the country. Man, it’s 2 diff thing! Perhaps your intention is not bad but you have no rights to say and make comparison if you don’t even know the journey of Muslims pilgrimage to Mecca. My I suggest for future, pls don’t quote religious practices to avoid unnecessary tension. I’m a Malaysian and I must say you’ve got an impressive list there. Tanjung Tualang Prawns aren’t typically on the radar for most tourists and they are excellent! Sang Har noodles and Nasi Dagang would make my list too! Hey Tim, thanks a lot, Malaysian food is amazing! 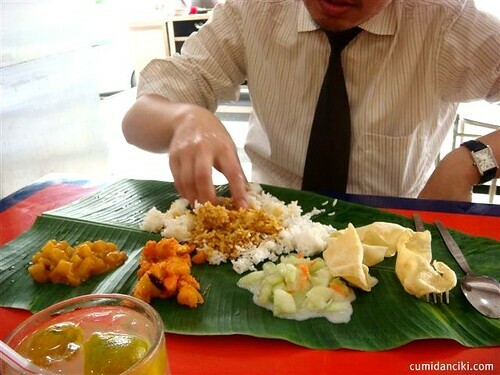 it would be nice to see all Malaysians eating banana leaf rice with hand regardless of what race you are, but most chinese don’t use hand because they think it’s kinda dirty and low class, don’t they? That would be cool. I think the food tastes just a bit better when eating with your hands! @presa1200: There are Malaysian-Chinese who use their fingers to enjoy banana leaf rice and there are those who use fork and spoon because they really do not know or have the habit of using their fingers to down the food. Not because they think it is low class or dirty. Eating habits differ in different places and countries, for instance Chinese in China would find it very odd to use fork and spoon, they use chopsticks; while the Chinese in Malaysia use fork and spoon to eat the plate of rice. Plate, not even bowls as in China, Hong Kong, Taiwan et al. Hey Adriana, I believe you!!! I love Malaysian food! I have a huge passion for Penang and Malaysia . 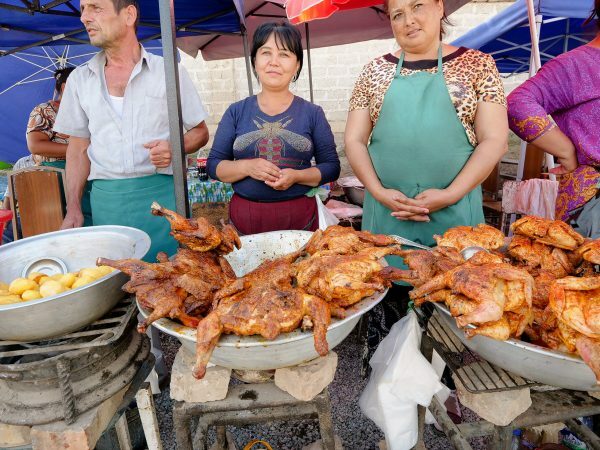 People come from all over the World to experience the variety of street food. Thank you for highlighting it . That’s exactly what I was thinking Lorna; those prawns are just killer! Hey Norbert, hope you can find a Malaysian restaurant in NYC, but if not, you’re going to have to visit Malaysia sometime soon! All the pictures look great! 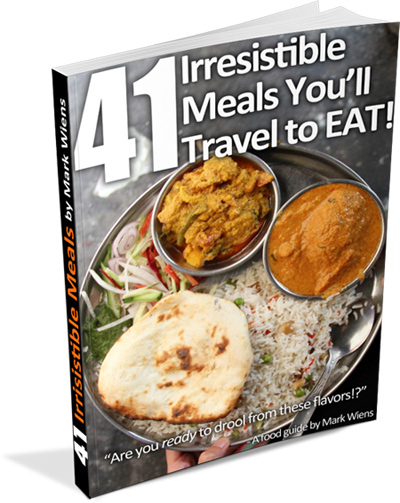 Do you know of any places (NY particularly) that serve real, authentic Malaysian food? Just wanted to also add that the BBQ pork particularly caught my eye!! Looks gret. Hmmm, not sure myself, I’ll ask Mei if she has any ideas for NY. Wow, these are some unique dishes. I think I would be challenged to eat BKT, especially if I saw the meat being butchered. I remember on some of my trips seeing the animals/meat hanging in shops and such and I always struggle with that. Thanks Lisa. Yes, the marketing of meat and other food is definitely visibly catching in Asia! I’m sure if you could sample the BKT you would love it! Awesome Ayngelina – what a great thing to be tempted by! I want to hear about the Malaysian restaurant in BA (if you can find one). The prawns are to die for. I miss large prawns. I can never get them that fresh here in the US. I do thing that eating on a banana leaf using your hands take the experience to another level. For me it makes the food taste better! I agree, being able to feel the food with your hands to understand the texture and feel of the food prior to eating it, is always a good thing! You love your food, don’t you? And I enjoy reading about it. Haha, thanks Inka, I do Love my Food! Absolutely delicious photo pics and interesting food in general…that Charsiew Rice dish looks tasty! Thanks for introducing me to Mei…she has a new follower! No problem, you will surely enjoy Mei’s food photography and articles! Thanks so much for the awesome article! 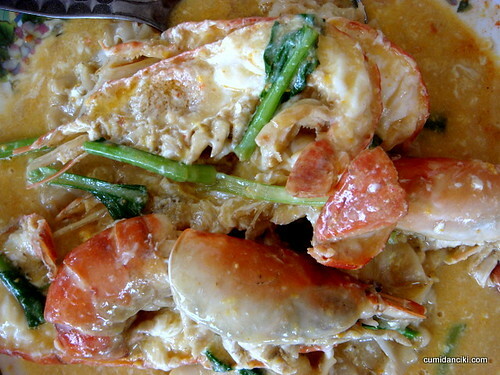 It’s making my mouth water and I’m dreaming about that “holy” pilgrimage to Tanjung Tualang for the fresh water prawns. Dipping them in ice water to stun them so they retain that springy texture is on another level of gourmet (a Malaysian level), sounds incredible! Thanks again!